Rubens Barrichello, who drove the car with Chassis nr. 206, in 15 of the season’s 16 races, made 10 podium finishes. Whereas the chassis 210 was the most victorious car with 4 wins by Michael Schumacher, the chassis 206 was the most successful by competing the 2001 F1-championship in 15 of 16 the races. This car has completed 13.340 km without any accident, having used 12 engines. The 10V engine is changing the 7 gears at 17.700 revs with the paddles on the steering wheel, using the throttle with the right foot and the brake with the left foot. The clutch, which is only used to drive away from the pitlane or the starting grid, is on the steering wheel. In the exclusive F1 Clienti program Ferrari offers their clients to own and drive a F1 car. As rookie Martin Lanting has driven the car in Fiorano and Monza. The general lap time reference is being around 10% slower than Barrichello. 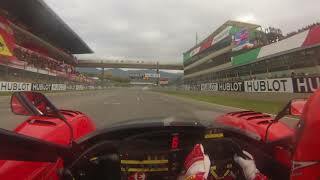 In Fiorano 1.05 against 58 sec and in Monza 1.33 against 1.21. Nr of cylinders and V: 10 – V 90degr.